Graphics are the most dynamic and vibrant elements of the digital world. They keep evolving every year to not only reflect the needs of the target audience, but also the requirements of the technological platforms and devices on which those graphics are used. Designers create the latest graphic design trends by not only experimenting with innovative ideas, but also aligning the designs with the needs of the ever-changing digital world. As the world moves forward, innovative, creative, and path-breaking design ideas are needed to create brand identities that resonate with the audience. Designers must constantly break the box and think of newer ways to make graphic design innovative as well as relevant. Let's peek into the graphic design trends to watch in 2019. In the world of information overload and too much of clutter, sometimes it takes simple and straightforward design to catch the attention of your target audience. Graphic designers are increasingly doing away with unnecessary design elements that take away the essence of the brand; instead, they are opting for simple yet powerful designs that convey the message succinctly. There was a time when a website or an advertisement almost had a predictable layout, but in 2019, we would see more of scattered grid style layouts where information is not where you would usually expect it to be. Designers are willing to break the old patterns and open-up the doors for newer and more creative layouts to catch the attention of today's millennials and also to make the audience enjoy the content discovery process. This is perhaps one of the major upcoming graphic design trends and is quite opposite to the minimalistic graphic design trend. The aim is to stop the readers in their tracks and take note of what is being said. Such chaotic designs and text-play will surely attract attention of the right target audience. With vast improvement in device displays over the past few years, we are seeing richer and greater variety of colors being used by designers. These color transitions are smooth and would be seen everywhere in 2019. Color gradients and transitions have become an easy way to make the design and backgrounds more attractive. This is the biggest among the new graphic design trends. Designers are leaning towards using more of violets and deep blue colors that give a galactic feel. These colors resonate well with the modern audience and appear brighter on mobile phones and other devices that offer rich colors and display capabilities. Duotone graphics used to be quite popular several decades ago. After being lost in the background for some time, it has made a big comeback over the past few years and is gaining tremendous popularity. Designers are increasingly opting for duotone designing to stand out from the clutter and make a quick impression. This trend is not going to fade anytime soon. Graphic design is transforming to include metallic colors as well. These were not used effectively by designers earlier as the devices used to print or view them did not do a good job. One of the graphic design trends to watch in 2019 would be the increased use of metallic elements in graphic design and typographies. Stock photos are losing their appeal, but in the world of memes and photo-sharing, it is becoming quite common to share images that have text on top. Not only graphic designers are utilizing this style, but also bloggers, Instagram users, twitter users, Facebook users, and other social media users. Many free applications have also come up for users to create such photos with ease and hence there's a rise in popularity. With the wider availability of stylus and digital pens that can be easily used on a touchscreen laptop or tablet, illustrations are becoming very popular. Designers are creating innovative digital illustrations as well as illustrations over photographs. This graphic design trend is surely going to remain strong during 2019 as well. Typography never goes out of style and with newer tools and technologies at their disposal; designers are taking typography to the next level. There's a limited time in which the message needs to be conveyed and it can be done better with the use of creative typography. However, creativity along with simplicity is the key here. Gone are the days when fonts were limited to the ones available digitally. The colors used in the fonts were also monotonous. Today's designers are coming up with more creative and colorful ways to write the text in an artwork. In fact, we are seeing a rise in vector fonts with many colorful elements being used quite frequently. A slightly animated image that keeps going on and on in a loop is among the latest graphic design trends to watch in 2019. The major advantage with such GIFs is that they look animated, but their file size is significantly less, thereby making is easier to share them over the internet. It is becoming easier to create such GIFs and cinemagraphs in the world of Instagram and mobile apps with a smart phone. This year, we will see much more of such graphics. The design trends of the past always make a comeback, and towards the end of 2018, it's time for the mid-century style illustrations to return. We are seeing such designs on hoardings, product packaging, digital media, advertisements, etc. There is also a rise in using mid-century style illustrations superimposed over modern photographs. As is the case with mid-century style designs, another trend that is making a big comeback is vintage style motifs. We are seeing them a lot everywhere. Although the designs are vintage, they are done with a modern touch and a lot of details are added to make them look intricate. Today's webpages and apps are becoming scalable and more responsive to meet the requirements of different screen sizes. The need for images to look and deliver the same impact on each device being viewed on has put graphic designers into a tizzy. They have to design in such a way that their work looks equally powerful everywhere. The use of vector graphics is also increasing due to this essential requirement. Graphics that look three dimensional but are not size-heavy are in great demand today. All the application developers, web developers and digital marketers are looking for new and appealing 3D-like graphics, without the burden of heavy file-size so that they can optimize the app performance. An image with more depth in bit ratio and perspective automatically engages and interests the viewers. No wonder, designers today are getting more creative and experimental in depicting depth in their designs and are trying various options to achieve the same. 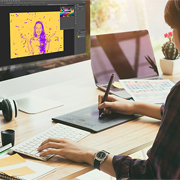 Many new techniques are being applied along with color transitions to create a feeling of greater depth in a two-dimensional design or a photograph. Negative space graphic designing was always there at some level, but we are seeing a huge comeback. Negative space designing leverages the empty space in the image and creatively depicts some idea through the cutouts. Negative space typography is also becoming big in 2018 and will continue its dream run in 2019 as well. Stock photo market was huge in the last decade and still is. But, in 2018, designers are looking for more natural style photographs that depict a particular mood. People have now become so used to seeing perfectly finished stock photographs that those pics have stopped conveying any meaning or sentiment to the viewers. The pics that have been photo-shopped to perfection are not effective anymore, as audience are looking for more believable photos - a trend designers are picking up on. In the world where the millennials are experimenting with newer ways to express their individuality, they are leaving no stone unturned. Designers are also creating innovative effects that were never used before, giving rise to the glitch or ruined effects. Such designs touch the pulse of the modern audience. 3D has now become mainstream, and designers are following this trend as well. One of the new graphic design trends of 2019 is increased use of 3D imagery along with bold and unique colors. Designers now have the tools and applications to make such designs possible. Outsource2india is a perfect partner for designing highly creative graphics for various kinds of business needs. We offer a complete range of creative services to cater to any requirements in animation, artwork, video editing, storyboarding, magazine layout, DTP, or content writing.